ABU DHABI, United Arab Emirates – There is no question what the most unusual craft is here at the NAVDEX portion of the IDEX international Defense Exposition. It's a ship designed by the Dutch firm Damen, built in Romania, systems integration handled by France's Thales, and fitted out and completed in the UAE by Abu Dhabi Shipbuilding. 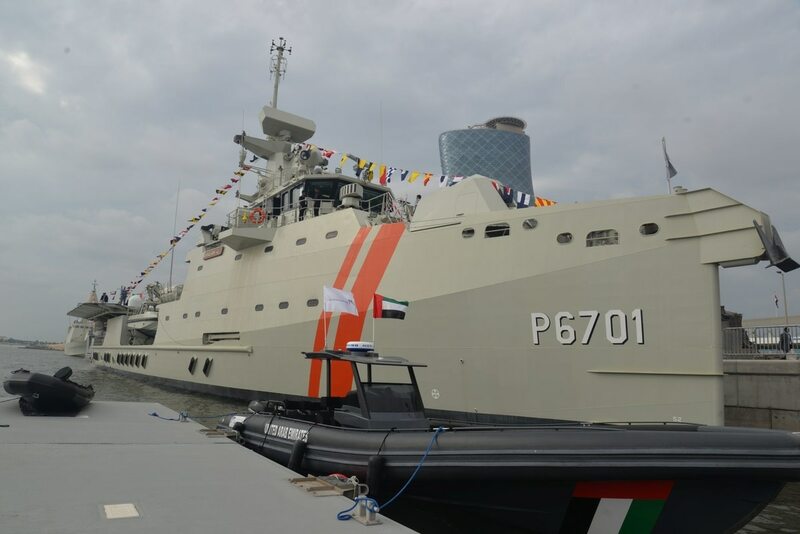 The brand-new offshore patrol vessel Arialah, delivered Tuesday to the UAE's Critical Infrastructure and Coastal Protection Agency (CICPA), has an incredibly tall, knifelike prow that towers over the pier. The forward edifice is capped by a BAE Bofors 57mm gun that almost fills the deck space around it. Immediately behind is the pilot house, itself topped by a fire control director, other sensors and a tall mast, all crammed in to about the forward one-third of the 67-meter-long hull. Amidships is a Rolling Airframe Missile (RAM) launcher followed by a long helicopter deck flanked by two high speed interceptor craft serviced by cranes. The high, narrow-bow, superstructure-right-forward configuration is similar to some of Damen's "sea axe" designs for commercial ships, including oil field anchor-handling ships, standby and emergency rescue ships and large tugs, but it is unusual in naval and coast guard ships. But the CICPA agency combines military and coast guard functions to protect Abu Dhabi's petroleum industry infrastructure "from any threats or any actions of violence," according to the CICPA web site. To that end, Arialah is uniquely fitted with systems more common to naval units, such as the Raytheon Mark 49 Mod 2 RAM missile launcher, Thales STIR fire control and Thales Smart-S Mark 2 search radar, two OTO Melara MARLIN 30mm automatic guns and the Rheinmetall MASS Multi Ammunition Softkill System decoy system, all managed by the TACTICOS combat management system. Other systems include a Mirador electro-optical system and Vigile electronic support measures. With a crew of 42, the ship also has berthing for up to 35 troops along with a three-person helicopter detachment. Crewmembers and officials for CICPA, Abu Dhabi Shipbuilding and Daman all declined to speak for the record about the Arialah, but a number of details were revealed in discussions on board and from earlier press releases. With a beam of 11 meters and draft of 5.4 meters, the ship, according to some of those who’ve sailed in her, is remarkably steady, aided by active fin stabilizers on the chined hull with deep-V bottom. Arialah is powered by four MTU diesels, each connected directly to its own fixed-pitch propeller. Three Caterpillar diesel generators provide shipboard power. Twin rudders and two bow thrusters aid close-in navigation. Top speed is more than 20 knots, with endurance about 21 days. Damen, Abu Dhabi Shipbuilding and CICPA reached an agreement to build the Arialah and one sister ship in December 2013. The hull was built at Daman’s Galati shipyard, and the ship sailed under her own power to Abu Dhabi for final outfitting at ADSB’s Mussafah shipyard.